Tiny shelled marine organisms called foraminifera can provide clues about earthquake occurrence in the past—and the future. Photo: UCMP. It feels like the world is still shaking from the earthquake and ensuing tsunami that hit northern Japan on Friday. The 8.9 magnitude quake created enormous waves of water, which moved quickly through the ocean and hit the coast of Japan with waves that in some areas were over 10 feet high. This animation shows how earthquakes give rise to tsunamis. When tsunamis hit shore, they can carry with them sediment that they’ve picked up from the bottom of the ocean. This sediment differs from the sediment close to shore, leaving a long-term record of the tsunami’s occurrence. Paleontologists can look at the layers of sediment along the coast and see records of past tsunamis. They can also see that before tsunamis occur, the land along the coast often starts to subside, as one tectonic plate slips underneath another. 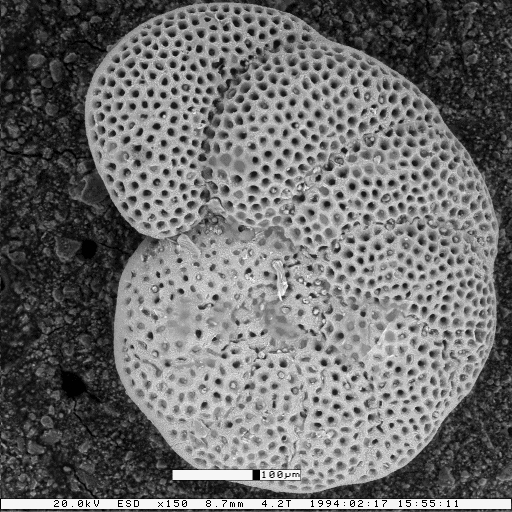 The clue that tells paleontologists that the coastline tilts before an earthquake is a group of tiny marine organisms, called foraminifera. By studying these organisms in the sediment along the shore of the West Coast, scientists can learn how frequently tsunamis occurred here in the past, and whether we can predict a big quake in the future. The tiny marine organisms in the sediment are called foraminifera, or forams for short. They are protists—neither animals nor plants, protists are a grab bag of simple organisms that includes amoebas, seaweeds, and single-celled algae. Forams are unicellular, and they build a shell, called a test, out of calcium carbonate. The test has little opening from which pseudopods—thin strands of the cell’s cytoplasm—protrude. The pseudopods help the forams move around. However, it is the calcium carbonate tests that make forams so useful as records of geological events. A few years ago, UC Berkeley Professor Emeritus Jere Lipps and a few colleagues, including Dalhousie University professor David Scott, travelled along the coast from Alaska to Baja, taking cores of coastal sediment along the way. They found that several years before a big earthquake and tsunami, the foram composition in the sediment changed slightly. The forams shifted from species that live in very slightly salty water to species that live in water that is even saltier. This is a sign that the land had begun to tilt downward towards the ocean. The Pacific plate is slowly sliding underneath the North American plate. But the plates stick together, and the edge of the North American plate gets pulled down slightly along with the Pacific plate. Suddenly, the plates will un-stick; the North American plate will release and move upwards again, and the Pacific plate will slide underneath. This kind if quake is called a megathrust earthquake. Dr. Lipps and his colleagues found that there have been three megathrust earthquakes, preceded by a tilt in the coastline, over the past 3000 years. Forams are good measurements of past coastline tilt. But to measure coastlines in real time today, scientists can deploy seismometers. By placing seismometers in areas that have undergone a pre-earthquake tilt in the past, we may be able to detect early warning signs of potentially destructive megathrust earthquakes and resultant tsunamis. Jere Lipps, the UC Berkeley professor whose research I shared in the blog post above, has a few comments I thought folks might want to read. He explains the important difference between subduction zone quakes (like Japan) and slip fault quakes (like the San Andreas fault) – and that’s an important distinction. It is quite amazing what these tiny little fossils can do. Just watch the video and you will know how beautiful these creatures are!